He’s just over a month into his professional career, and world under 23 road race champion Michael Matthews has clocked up his first UCI WorldTour victory. He nabbed stage two in the Tour Down Under, and also finished fourth overall in the race plus second in the points classification. Hitting the ground running in such a fashion suggests a big future is in store, and his Rabobank team-mate Luis Leon Sanchez has paid him a big compliment. He compares him to another rider from the team who has worn the rainbow bands, although the praise is also mixed with a gentle ribbing. Triple Elite world champion Oscar Freire is regarded as a near-genius on the bike, but a calamity off it. He is known as being very forgetful, getting separated from his team-mates and lost the day before his 2001 world championship win in Lisbon. He’s also forgotten his shoes before a race, as well as many other such incidents. Freire’s absent-mindedness is part of his legend, though, and so Sanchez’s comments shouldn’t be seen in a dismissive way. The team pulled off a coup when it signed Matthews last season. The deal was finalised long before his world championship win, and was done on the back of performances such as two stage wins in both the Tour de Langkawi and Ringerike GP. 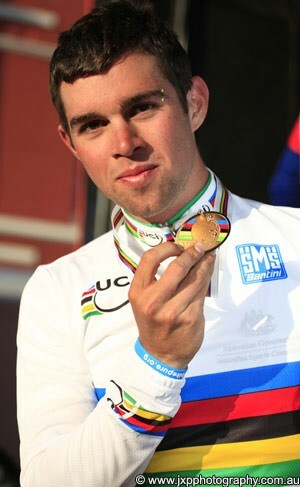 He also picked up a stage victory in the Tour of Japan and finished eighth overall in the Tour de l’Avenir. He is currently racing in the Mallorca Challenge events.